If you tuned in to the live show on my Facebook page Spark Creativity and would like some notes on tonight's episode, or you missed it and you'd like to see the basic transcript, here it is. Of course, you can still watch the replay right here! Welcome everyone, to tonight’s episode in our collaborative series ELA Live. I hope you’ve been enjoying the strategies and tips we’ve been sharing in the series since August 1, and that you’ll continue to tune in to the end of the series August 15. I’m Betsy Potash from Spark Creativity, and I’ve been coordinating this series for you. I’m really excited you’re here, so let’s get into it! Tonight’s show is all about ENGAGING students. 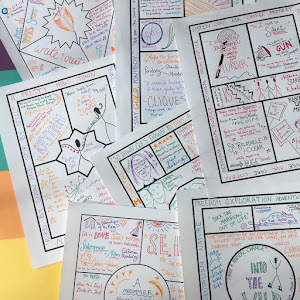 I’m going to share with you the most powerful way I’ve found to make my students look forward to class, to feel they have authentic audience for their work, to help them become interested in material that doesn’t necessarily have immediate appeal for them. Opening Question: What's one project you remember from high school? For me, it was the obscenity trial of Gustave Flaubert. I didn't like Madame Bovary at all, but my A.P. Literature teacher had us recreate Flaubert's trial and I was the defense lawyer. Though I didn’t like Madame Bovary at all, but when this project was introduced I became obsessed with my preparations as the defense lawyer. I dove deep into the material and ended up producing a five page single spaced opening argument that left the prosecuting lawyer's jaw on the floor. It is still one of my happiest memories of high school, and I have fond memories of Flaubert now instead of negative ones. 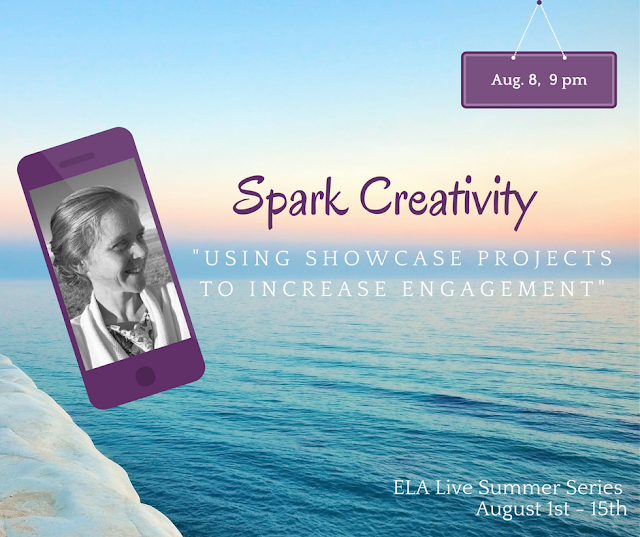 We’re about to dive deep now, and I can't wait to tell you about this powerful teaching strategy. It’s really the core of both my happiness and success as a teacher, and I’m excited to tell you about it. First we’re going to rewind briefly to my first day as a teacher. Let me just say that I love teaching and I feel very comfortable in the role now, but my first day was a DISASTER. Yes I did cry on my office floor after my students went home. Yes, for a long time. Then I realized I was never going to do anything like that again. I didn’t feel comfortable in the front of the room, and I didn’t like trying to captivate students in a lecture style. It made me feel tense and isolated from them, and more than a little ill.
Game changer! I spent the rest of the year building a showcase project curriculum. For every unit of material we covered, we worked on some larger exciting project to draw the students into the material. I never lectured, but I stayed up late virtually every night concocting big plans for the next day. We did play performances, poetry slams, literature circles with multigenre final presentation, guest theater workshops, and much more. 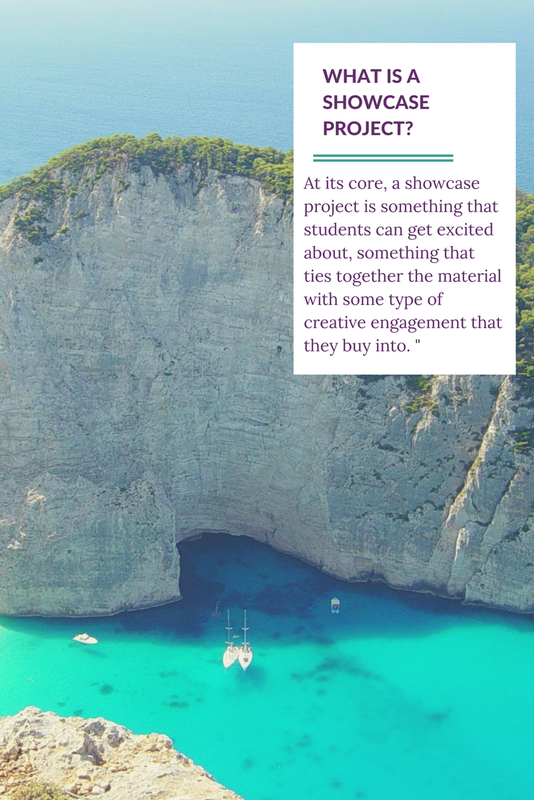 At its core, a showcase project is something that students can get excited about, something that ties together the material with some type of creative engagement that they buy into. Think of my experience reading Madame Bovary in high school. To tell the truth, I thought it was dullsville. But I LOVED going to English class to learn more about it once I was involved in the trial of Gustave Flaubert. A showcase project could take so many forms. Maybe students start a youtube channel to share videos scenes they film of The Great Gatsby to help students around the world understand the novel better. Suddenly their own reading lights up. Maybe they prepare a play version of Huck Finn to perform at the local elementary school. Suddenly understanding the important moments of the text really matters to them, as they prepare to walk on stage in front of a truly authentic audience. Let me tell you about a couple of showcase projects I’ve used over the years to help you visualize it. One that I began as a first-year teacher that I have done every year since is the poetry slam. I still remember sitting up the night before I began my poetry unit. I was using the text I had been given by my school, 8 Great American Poets. And the poets were great. But I was not convinced my students would think so. I wanted a way to bring them into the topic that would captivate them right away. Which is when I stumbled into poetry slam. I found some audio clips, ordered a documentary called Slamnation and quickly put together a syllabus that would allow us to prepare for our very own poetry slam in just a one week unit. A bit ambitious, but it worked! As I taught students the concept of performance poetry and we pretended to be slam judges, scoring the clips we watched in class, they were looking at poetry in a new way. A good way. Suddenly the literary devices I introduced really mattered, because they wanted to use them in their own slam poems. Suddenly Wallace Stevens’ “13 Ways of Looking at a Blackbird” was fascinating, as we did a writing workshop in which they wrote their own 13 ways poem, and many of them chose their own version as their performance piece. The project creates the buy-in. It brings the students to the table with the material with their eyes wide open and their minds engaged. I want you to have this experience and see how great it is. I’ve linked to a page where you can register to receive curriculum for five projects I’ve created that can be used with any novel. This is one of my favorite products in my TPT store, but I’m going to give it away to everyone watching tonight who wants it, because I really want you to test out my favorite teaching strategy and I’m sure that you will love one of these projects enough to put it into use right away. Feel free to share this link with other teachers, or to give away one copy of the packet itself once you get it. Usually you can't share TPT products because of copyright issues, but I'm going to waive the rule this time. I really want more teachers to try this strategy. OK, moving on to another example. Have you ever taught a text that your administration chose for you, and you knew would not be engaging for your students? For me, the worst was The Canterbury Tales. I was teaching sophomore English, and the majority of my students were English language learners. I was coaxing them along, trying to help them fall in love with literature. And then came Chaucer. Now, don’t get mad at me. I know Chaucer is a genius. He just wasn’t the right genius for them just at that moment. Every day they came into class with blank stares and dozens of questions about meaning and content, not themes and style. Despite my efforts to help them engage with fun daily activities like creating a Facebook profile for the Wife of Bath, they hated The Canterbury Tales! Then I thought of a project to draw them in. We would have our own tale-telling pilgrimage. They would write stories and hone them as we read Chaucer. Then we would traverse the campus, stopping here and there to hear tales performed and ending with a feast and an awards ceremony for the best tales, as chosen by the class. Immediately the atmosphere in class improved. Students were now actively engaged with the concept of our storytelling festival, and suddenly the difficulties faced by each tale-teller in Chaucer’s narrative were hitting home. How to impress the listener (or reader!). Should they use humor? Retell a classic story? Get personal? What kind of language would entrance? Through their personal connections to our project, their literary connection to Chaucer grew. We had a blast with our storytelling pilgrimage, and in the end I think every students walked away from a unit that started disastrously with a fond memory of good old Chaucer. It wasn’t about replacing the text with something more fun, it was about creating a legitimate fresh engagement with the text through the project. That's really the crux of showcase projects, and I can't wait for you to start reaping the rewards. Hit me with your questions in the comments on the FB live video! I hope to answer every single one.